Spanish Syllabi: SPAN 131 (Introductory), SPAN 231 (Intermediate), SPAN 331 (Advanced) email admissions@patagoniastudyabroad.com to request specific syllabus. Based on prerequisites the student will be placed in the proper level of Spanish. What if you have zero to little Spanish experience? Or what if I am seeking Spanish fluency? Typically, the beginner Spanish course is our biggest class with second year Spanish the next largest class. So, even if all you know is donde esta el bano? youll be amongst a group of peers learning at your level. Advanced Spanish students will enjoy the personalized instruction as they get to be instructed privately. Your Spanish speaking skills will exceed even your own expectations. The PSA Spanish courses are advantageous to learners in that we’ve uniquely combined class structure, cultural interactions and an immersive learning design that is both fun and interactive for students. 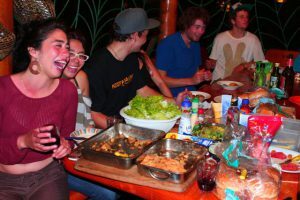 PSA students and Pucon universidad students do a host exchange of American style BBQ for a Chilean style asado as a cultural event. Judge for yourself if they are having fun with their Spanish learning. Immersive Spanish Design- The Spanish courses and program are designed to be immersive Spanish outside of the structured class. This means your Spanish practice and exposure will be a multiple of your mandated class hours. For example, you’ll have to communicate as you take the bus to classes, order meals, and hangout with Chilean students at the university. This participatory model of learning accelerates the way you understand the language. “But I don’t know anything about Spanish!” It’s OK. Of course we’ll help you along the way. Relative assignments will teach you the survival basics. And you’ll soon realize that it’s more about jumping into the language and trying more than anything. Your Spanish class utilizes a Latin Dance class one night per week furthering your cultural experiences and language practice. Latin Dance Component- That’s right! One night a week you’ll be learning salsa and Cueca (National Chilean Dance) as part of your Spanish course. Maybe more important than learning the art of dance is the cultural history and influence of dance as well as the cultural impact you’ll get from your dance class interactions. Yes you’ll trip, bumble and spin the wrong way and that’ll be part of the fun. But you’ll also realize that this is a warm afternoon activity on those cold Pucon nights that provides another way for you to interact with the community. Do you know why the national Chilean dance was banned during the Pinochet dictatorship? Read our Easy to Apply application.